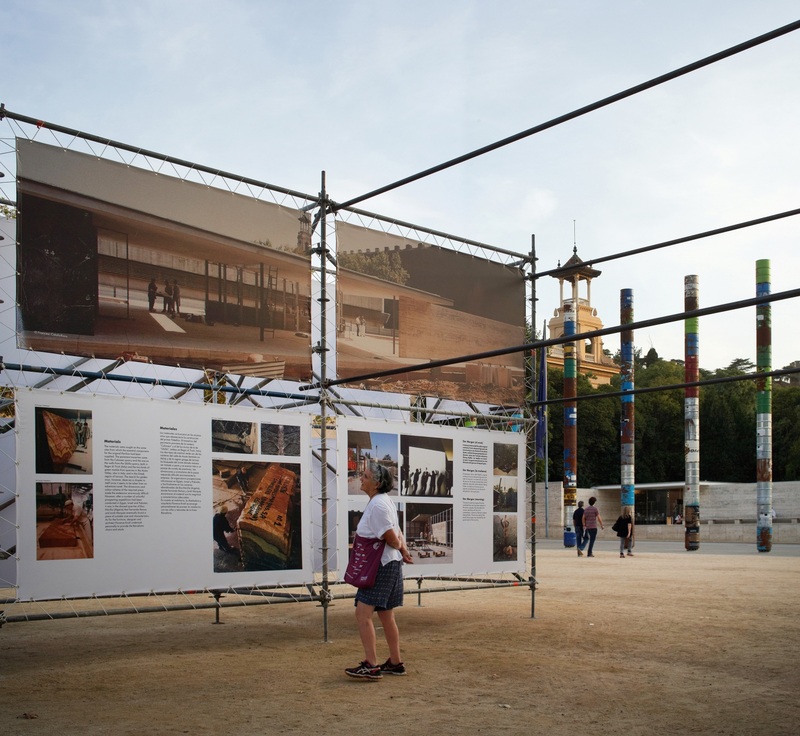 Ephemeral exhibition project on the lives of the Barcelona Pavilion designed by the architect Mies van der Rohe as a way of sharing the Foundation’s work on the 30th anniversary of the reconstruction. The Barcelona Pavilion or German Pavilion is an emblematic building of the modern movement in architecture, designed by the famous German architect Mies van der Rohe. However, it is largely unknown by the majority of citizens of this city, as its main visitors are accidental tourists or architecture connoisseurs. 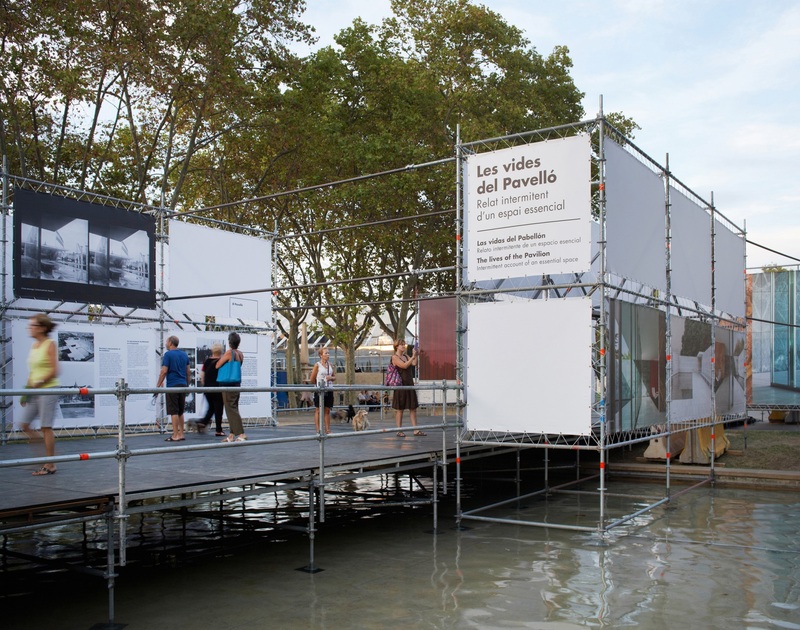 The purpose of this exhibition is to share the Pavilion with a broader and larger audience while paying tribute to the 30th anniversary of its reconstruction and also recalling the history of its presence and absence since it was originally built in 1929. 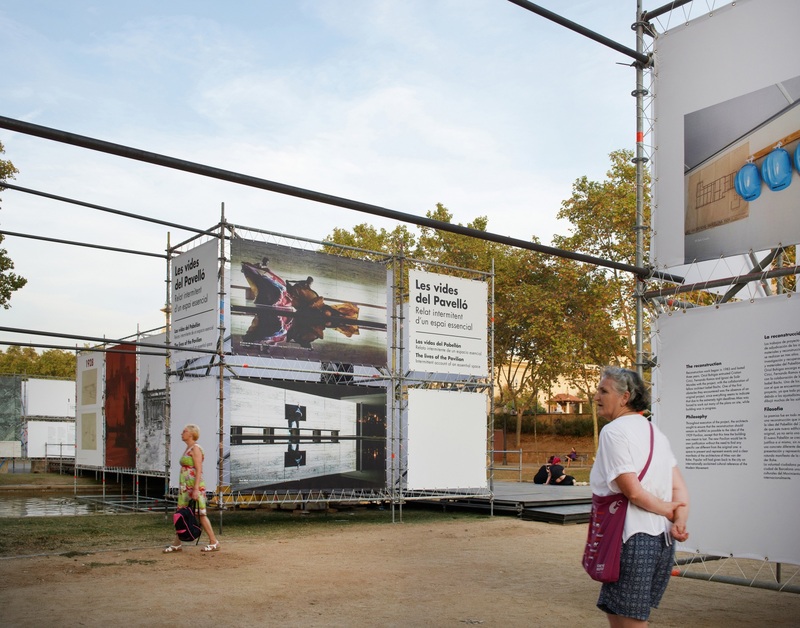 To accomplish this, it was decided that instead of filling the pavilion with panels that hinder or impede views of the architectural space and change the light or transparency, the entire montage would be set up in its immediate environs in order to further take advantage of the traffic along the main arteries in Fira de Monjuic to attract visitors to the building. Plus, a platform was built over the fountain located in front of the pavilion which blocks the access route, making it easier for visitors to approach it. The exhibition is divided into three nuclei. 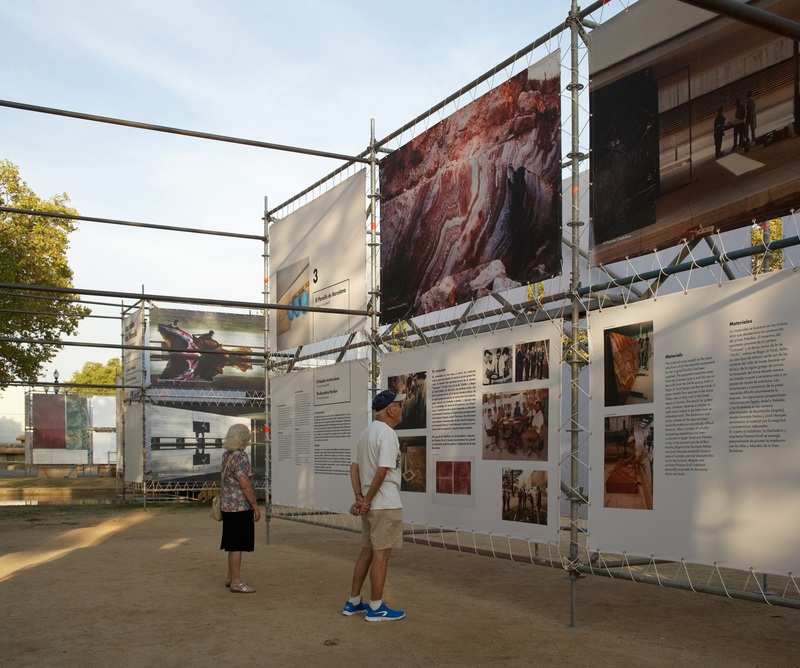 The first stage examines the German Pavilion, which was built as an ephemeral construction for the 1929 Universal Expo. The second nucleus is devoted to the Invisible Pavilion. Yet the absence of the pavilion until it was rebuilt in 1983 did not mean that it fell into oblivion; instead, it never stopped existing in the memories of those who knew it, and it remained in the history of architecture as a flagship of the values of an era. The last part is devoted to the reconstruction and the efforts of the Mies van der Rohe Foundation over these past 30 years to adapt the building to new uses and share scholarship, allowing the Barcelona Pavilion to retain its mark on the past while ensuring its future. 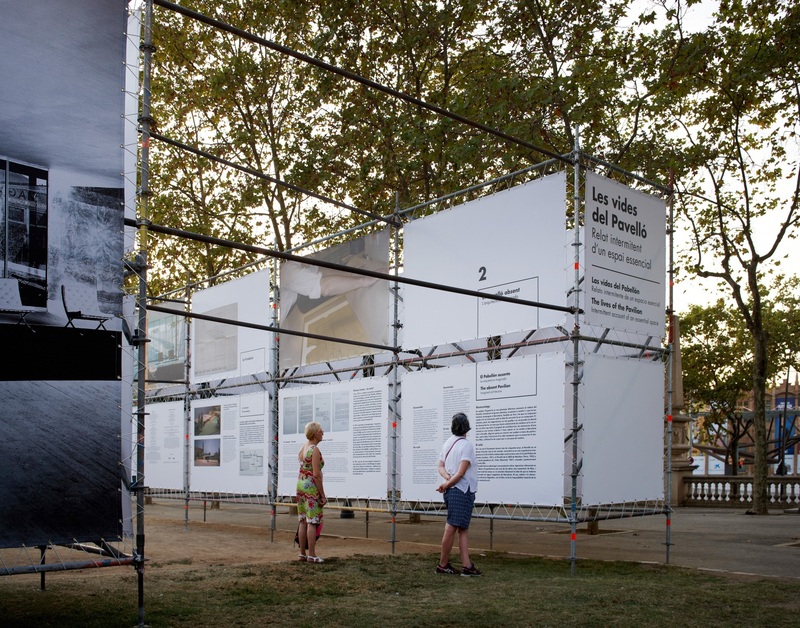 One of the most important projects undertaken is an entire series of artistic interventions that the exhibition showcases, with installations by artists and architects like Ai Wei Wei, Antoni Muntades, Kazuyo Sejima, Ulrich Meister, Jeff Wall, Íñigo Manglano-Ovalle and Andrés Jaque, among many others. It thus revisits the important artistic events that have taken place inside the pavilion, proof of its health and vitality as an engine of thought and creative action. 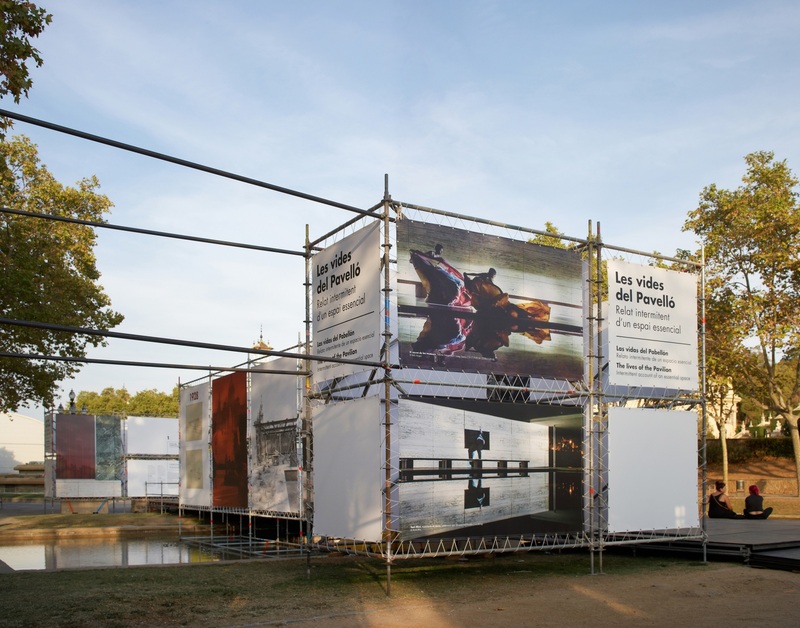 This montage was designed to be ephemeral in homage to the original purpose of the pavilion, while respecting the building and its environs to the utmost.